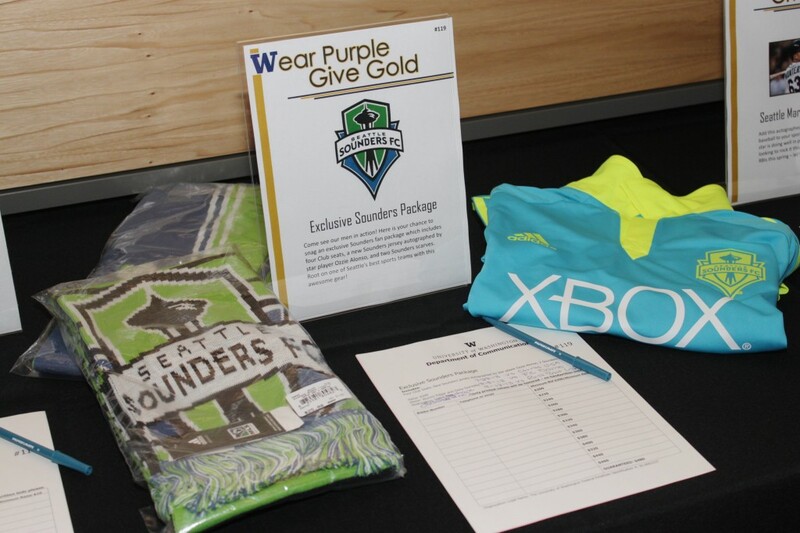 Last Thursday marked the fourth annual Spring Fundraiser event in the form of a silent and live auction at the brand new Husky Union Building. The Department of Communication has raised $176,000 to date at past fundraising events, and in one night was able to raise more than $37,000 – every dollar going to students. In just the past few months, fundraising money has supported the Olympia Program’s 40th year, a weekend trip to L.A., a winter study abroad in Rome, Death over Dinner, a new debate program, a day of service at NAAM, launching the CL program, playing a signature role in the Seattle Asian American Film Festival and the Women Who Rock conference, and bringing more than 30 alumni to campus to meet with students for mentor lunches and Career Kickstart events. Three students (undergraduate Deanna Isaacs, Ph.D. student Luis Padilla, and MCDM student Amber Cortez) spoke at the auction describing how they have flourished with the opportunities made possible through donated funds. Faculty, alumni, and guests bid on several items, including a boutique brewery package, a Yakima wine weekend, and Seattle Mariners memorabilia, while enjoying spring rolls, mini sandwiches, and sipping on wine. There was a raffle for a cruise and many also got their photo taken with Dubs. Oh, and did I mention the mountain of candy in the center of the room, donated by All You Can Sweet? Alumnus and 2010 Hall of Fame inductee, Terry Tazioli kicked off the live auction offering Seattle Sounders tickets, an improv team-building workshop, and an Italian dinner cooked by none other than himself. And what could have been the most generous moment of the night was the Fund-A-Student bid, where $3,000 was raised on the spot, with an anonymous donor matching that amount. We want to extend a thank you to everyone who donated and continues to support the Department – faculty, staff, volunteers, alumni, item donors, and guests.